In 10-inch skillet, melt 1 tablespoon of the butter over medium-high heat. Sprinkle steaks with 1/2 teaspoon salt and 1/4 teaspoon pepper. Cook steaks 4 to 6 minutes, turning once, until deep brown. Reduce heat to low. Cover; cook 6 to 8 minutes for medium-rare to medium doneness (don’t overcook; beef will continue to cook while standing). Remove beef to platter; cover to keep warm. Increase heat to medium. Add remaining 2 tablespoons butter to skillet. Add mushrooms. Cook 3 to 4 minutes, stirring once or twice and scraping up any browned bits, until tender. Add wine and cooking sauce; heat to boiling. Reduce heat; simmer 3 to 5 minutes, stirring occasionally, until sauce is hot. 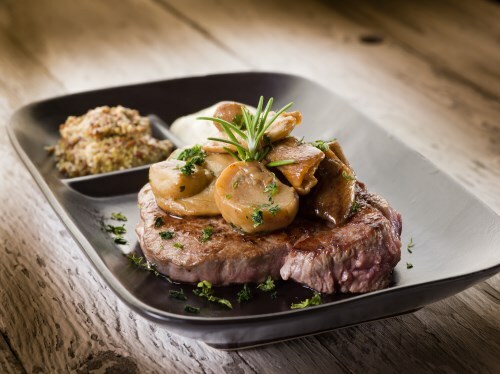 Serve mushroom sauce over steaks.